Hi! 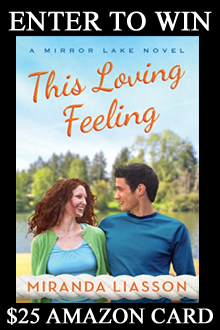 I’m Miranda Liasson, and I won the Romance Writers of America's Golden Heart Award in 2013 for a story that became my first published novel, This Thing Called Love, which debuted from Montlake Romance in 2015. Like most of my novels, it's lighthearted but also, like life, has a little bit of heartache in it too. I love stories that have happy endings and make me laugh. I hope my stories make you laugh a little, too.